Michael Nearing, an engineer with the city of Ann Arbor, wields a hammer. 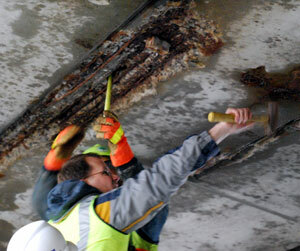 The hammer was used for two different purposes: "sounding" the concrete for structural integrity and clearing away de-laminated concrete so that it would not fall on cars below. 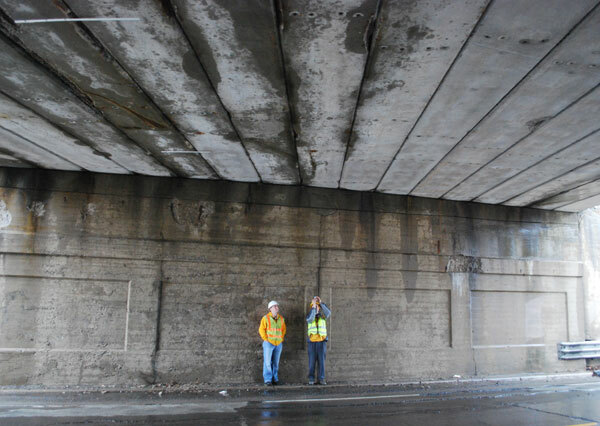 In her update to city council in early March, Sue McCormick, the city’s director of public services, indicated that the bridge was being closely monitored in order to verify the safety of the bridge. Here at The Chronicle, we wondered what “monitoring” entailed. An emailed request to Homayoon Pirooz, project management manager with the city of Ann Arbor, resulted in The Chronicle spending part of a rainy Wednesday morning under a bridge with a handful of staff from the field services unit and two engineers: Michael Nearing, senior project manager for the city of Ann Arbor’s project management unit, and Jonathan Drummond, with Northwest Consultants Inc. 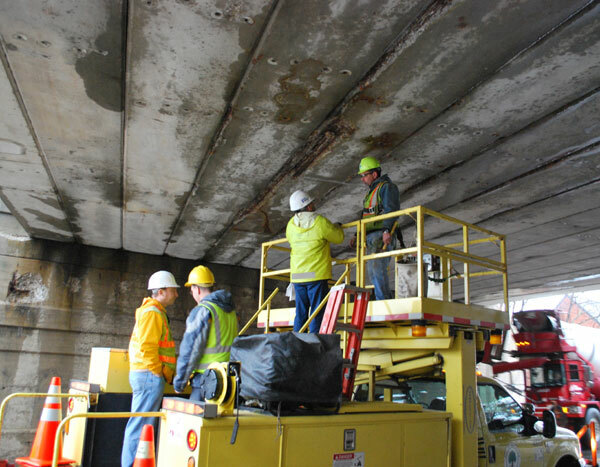 The weekly monitoring entails regulating traffic under the bridge to allow for a truck with an elevated platform to park and lift the inspectors right up to the underside of the structure. Traffic control was done by a two-man crew, born and bred in Ann Arbor, one wearing a hardhat stickered with a UM winged helmet. They let cars through the one-lane gap on an alternating basis. Nearing briefed us on the basics. The idea was to check the bridge weekly for additional displacement of the fifth beam to determine if the traffic re-routing had allowed the beam to stabilize at the 7/8-inch deflection, plus give the rest of the bridge a visual once-over. After 6-8 weeks, if the beam doesn’t show any further sagging, the plan is to reduce the frequency of the inspections to every other week. Although the word “beam” is, to a layman, perhaps suggestive of a solid block of concrete, the beams have a hollow box as a cross section. Their strength derives from the steel strands in the bottom of the box. Such box beams are manufactured remotely and brought to a construction site fully cured. At the manufacturing facility, the steel strands are stretched under tremendous tension and the concrete is poured over them. When the concrete cures, the force of the pre-tensioned strands is applied to the concrete, which gives the beam its strength. Without tension the strands don’t add the same strength. Thus Nearing said that the seven exposed pre-tensioned strands on the fifth beam were no longer contributing to the strength of that member. 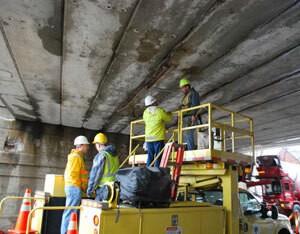 But on Wednesday morning, the fifth beam was holding steady at a 7/8-inch deflection. The measurement was taken at a point marked with a metal strip fastened into place along the beam to ensure the measurement was taken consistently at the same point from week to week. This week, at least, the beam hadn’t measurably sagged any lower. Still, Nearing and other field services staff took the opportunity to chip away bits of loose concrete from the area, so that they would not fall on their own – possibly onto the windshields of State Street traffic. And it’s definitely the traffic under the bridge that Nearing said he was concerned about – as much as the traffic going over the bridge. In fact, Nearing did not assess a dramatic collapse across a whole lane’s width as very realistic possibility. He was more concerned about pieces of concrete falling onto State Street traffic. Here’s why a whole-span collapse isn’t realistic. Even though the beams are tied together, Nearing emphasized that each beam was designed to bear the whole load of its section of the bridge. And given that the beams are not individually wide enough to allow a car to fall through, even the failure of a single beam would not result in cars falling through the air. In addition to the fifth beam, the eighth beam had caught Nearing’s attention. 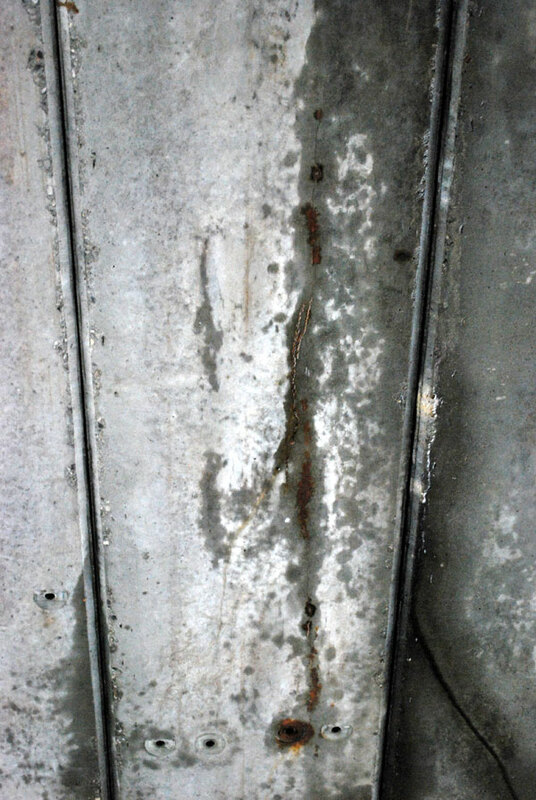 He said it was starting to show signs of a longitudinal rust stain, very similar in appearance to how the fifth beam looked before the pre-tensioning strands started to expose themselves. That eighth beam doesn’t figure in the current plan for a bridge repair scenario. That would entail replacement of just as many beams as necessary to get at the weakest one – the fifth one. And that would mean the five beams on the southern side of the bridge would be replaced. Nearing said that although a repair plan had been drawn up, whether it gets implemented depends on how soon funding is available [possibly via the second round of federal stimulus package money] for a complete reconstruction, including the adjacent bridge over the railroad tracks. If funding for complete reconstruction isn’t forthcoming in the next couple of years, the repair scenario (replacement of some limited number of beams) could be implemented. Nearing walked us around to the top of the bridge and pointed out where it’s not just the box beams that are an issue for the bridge. The wingwalls are in poor shape (daylight is visible where there should be concrete), and the sidewalks are starting to slope downward where the embankment is gradually giving way. The crater-like asphalt surface of the bridge lets water through – wet spots on the underside of the bridge were visible on that rainy morning. 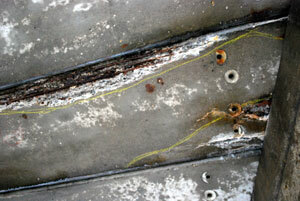 And the drain holes in the beams are to some extent clogged by an artifact of their construction technique. Namely, the hollow areas inside the concrete boxes were created with cardboard forms when they were poured, and the cardboard, as it gets wet, falls apart and winds up clogging the holes that are meant to let the water out. 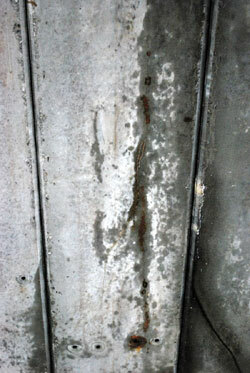 Water inside the boxes, combined with freeze-thaw cycles, accelerates the deterioration of the bridge’s condition. In the coming few weeks, there’ll be additional monitoring trips. We’re not planning to accompany Nearing on every one of them. But we’ll try to keep readers posted on any new developments. 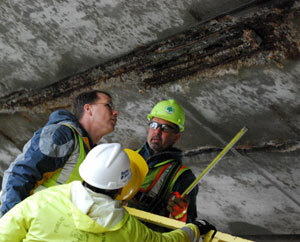 Michael Nearing, left, engineer with the city of Ann Arbor, gives the underside of the East Stadium bridge a closeup inspection. 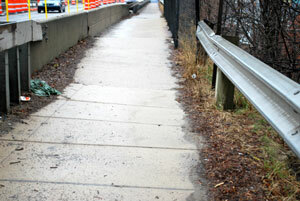 The surrounding support structures also show signs of fatigue, like this sidewalk that has settled to tilt downward from right to left as the embankment weakens. The chalk outlines were drawn during the Octoboer 2008 annual inspection to indicate the limits of where the de-lamination of the concrete were thought to be at that time. I suppose the city has given this a lot of thought, but why are these bridges still necessary? Why spend $20-30 million to replace them instead of removing them completely eliminating the grade separation with the railroad tracks and State Street? There is almost no traffic on the railroad and it would be great to have a direct connection between E. Stadium and State. Removing the elevated roadway and building new intersections wouldn’t be cheap but my guess is it would be a lot less than building new bridges. I wonder how much energy and CO2 emissions would be saved by removing the necessity to exit to Stimpson, etc. and all the other dodges needed to get between State and Stadium. Also, I would expect that it would be more accessible to pedestrians and cyclists. Isn’t there an urban legend that the original separation of the two roads was to manage traffic on football days? I don’t think one should assume that there will always be limited rail traffic through this intersection. If the proposed commuter rails to Detroit and Howell come to fruition and are successful, one could imagine a day when the WALLY line is extended through southern Ann Arbor (perhaps to Georgetown) or possibly down to Toledo. There are a lot of folks who work in the South State area. ALthough most of the rail use is during the night, I have actually gotten stuck on State street waiting for the train to pass during the daytime. And I might add that it is the slowest train I have ever had to wait for….inch by inch it crawls. It is enough to drive you crazy. I agree with removal of the bridges. They were built when railroad traffic volumes were far greater. Wally would add maybe 4 trains a day to the mix–and theoretically they will all be rather quick and short. My office was next to the tracks for 8 years and there were very few trains each day and they are almost always very short. The AARR is really just a shuttle service these days–it does not carry long distance freight trains that are a mile long. The UM athletic department would benefit from the removal of this visual and pedestrian dam in the middle of their athletic campus, too. Sorry for the typos. I need an editor! “Other than people not liking the horns,”… there seems to be very little inconvenience caused by current train traffic. It has often been my experience that when I’ve asked “Why don’t we do X?”, when X seems like a good idea, that there are often a number of really good reasons why X, although attractive on its face, isn’t really practical. One explanation for this is may be that my notions of X are inherently foolish; another (I’ll go with B!) is that in a town as active as ours that many ideas have already surfaced once or twice before and been carefully considered. I have learned to ask Staff first “Has anyone considered X?” or “Do we already do X?” rather than to declare “We should do X” before I know the facts. It’s then my obligation to dig in. Although it may seem this way, I do not mean this at all by way of censure — not at all; it’s just that as a Councilmember I get to see a good deal of detailed hard work and long-term thinking that is not readily apparent to the Public. I’d like to help with that a bit. The memo sums up all the long term thinking nicely. In Plymouth on Sheldon road and M14, the at-grade RR crossing is being coverted to a bridge over the tracks because of all the backups and headaches that this crossing has had. If you have ever been stuck at this crossing when a train is passing, you literally can be stuck for 10-15 minutes. Plymouth is upgrading to our present system; our system just needs a repair or replacement, but is probably the best solution according to the research in the memo. I think that Vivienne posed a pertinent question about the current costs of fuel and delays (including the resulting pollution) from traffic not being able to directly access State from Stadium and vice versa. It doesn’t seem that a potential decrease in those costs were taken into consideration in the analysis presented in the memo. It also seems that they gave no consideration to the potential for a decrease in traffic in the future. One possible opportunity that could arise from such a scenario is that Stadium could be reduced to three lanes, rather than needing to be expanded to five to accommodate the at-grade intersection. That would likely lower the costs of the bridges (or the intersection and crossing), but it’s not clear how everything would balance out. Mr. Nearing is a master of understatement. I asked the question, in part, because my inquiry to Homayoon Pirooz regarding removal of the bridges went unanswered. I too might have ignored such a question on a topic I thought to be settled–people not involved in the process can be so annoying. However, while the no-bridge analysis goes into great detail cataloging the many societal costs of removing the bridges it completely ignores the same costs that result from the current condition. The contorted efforts of motorists taking White to Stimson to State, or using the Stimson/S. Industrial route must carry many of the same costs. Perhaps the costs, and difficulties of acquiring right of way are too great to overcome. I am glad, at least, to see that an analysis was done. I live near to the tracks, and get more abuse during the winter when the University uses dump trucks (and a tractor I call “Der Wolvenpanzer”) all night long to dump and move their snow. The tractor rumbles my floorboards, and the backup sounds of the trucks at 2, 3, and 4 AM make me pine for the mere grumblings of trains. The memo is typical traffic engineer cost-benefit analysis that makes outdated assumptions using statistical models instead of practical measurements, real-life observations of the location, and common sense. Just because you put Stadium at grade does not mean you have to widen everything out to 6 lanes in every direction. I’m sure a creative transportation designer/engineer can come up with something better than that–potentially continuing to use Stimson as a way of relieving some of the load. Why not use real statistics for AARR/automobile incidents from the eleven at-grade crossings we already have in Ann Arbor instead of these statistical models (New Hampshire Index and Peabody-Dimmick)? I’m sure there must be an incident on the AARR line in Ann Arbor from time-to-time, but I’m having trouble recalling any. Ironically, I just met with an Ann Arbor traffic engineer the other day to observe traffic on a street near downtown. After remarking at the unexpected volume of traffic we were seeing, I asked if we couldn’t put one of those car-counter boxes in for a few days to get an accurate count. He said they had all burned up in a fire and the City hadn’t replaced them. I guess we don’t need real data when one can sit in a cubicle and pull up online statistical models. Right? For the sake of full disclosure, I know nothing about this project except what is in this article, comments and linked pdf letter. I would like to make some remarks about the planning and design process for road and bridge projects. I need to know 5 pieces of information before I start a design: 1. The design year (Typically 20 years in the future), 2. The existing traffic volumes (car counts), 3. The projected traffic volumes for the design year, 4. The design speed for the project, and 5. The design vehicle. The road is designed for the projected volume of traffic in the design year during the highest peak hour of travel. Loosely speaking, the peak hour is the daily rush hour, either morning or evening. As a traffic engineer, a grade separation is always preferable to an at grade intersection. Yes, bridges are expensive to build and maintain. The reduced impacts to traffic delays, response times for emergency services and crash reduction is far superior to an at-grade crossing. Which would you rather have a faster EMS response time with the bridge or risk a person dying because the ambulance was stopped by the train. The Illinois toll way says every minute that a lane is closed results in 4-5 minutes of congestion. In response to Mr. Whitaker’s comments about the statistical modeling, the $250,000 figure is an assumed cost to society because of a crash. When we are in a crash, we see the price to fix our vehicle. What we do not see is the price to society. Whenever there is a crash, there are “hidden” costs associated with the crash response that may not paid by the drivers, such as police, fire, ambulance, morgue. These are the obvious costs paid by the taxpayer. Less obvious are all of the costs associated with anybody who ever touches the crash report. The crash modelling is a little bit out dated only because AASHTO will be publishing the Highway Safety Manual. It is my understanding that it will be published later this year. This manual will give a traffic engineer rigerously tested, research based models to predict the number of crashes that will occur at an intersection. The manual will also provide proven methods to analyze an intersection and suggest methods to reduce the number of crashes. The Center for Disease Control says that highway fatalities are a national epidemic. Every year, approximately 44,000 people die on the roads of the US. More people die on the highways than people dying of a heart attack. If 44,000 people died of a contagious disease, there would be national outcry for the government to do something. If I wewre living in Ann Arbor, I would be pressing my legislator to get the bridge rebuilt as soon as possible. And I hear there may be weapons of mass destruction at this intersection, too! By way of follow up, the City lost 10 of 15 counters in a fire at an airport storage building last July. We currently use the remaining counters and borrowed counters from WCRC and the county “pool” counters to take care of Federal counts and traffic calming counts. Staff has confirmed that our required work has not been jeopardized although it is true that the City is now less able to meet special requests or discretionary counts. We are in the process of replacing the lost counters to give the City more flexibility in this regard. Societal costs is an interesting element of traffic analysis (at least to this observer). Are good data, or at least some statistical models, available to help evaluate the costs of failed pavement? What about lane elimination, either on a “typical” commuting hour, or during event-related traffic peaks? What additional cost arises from the closure of Stadium during construction (for bridge elimination or reconstruction)? What is either the short- or long-term impact of the construction on traffic diversion to, say Hill or even Eisenhower (each of which are in less-than-perfect condition now)? Do additional miles or minutes in the trip diversion not result in additional accidents as well, to say nothing of additional fuel and so on? One other thing, which is related (or not): Has the project for the reconstruction of Stadium between Pauline and the State/RR bridges been delayed, put on hold, or cancelled altogether?